Lensbaby today shared with us their release of two new cleaning products designed especially for their Lensbaby optic system. The Lensbaby Lens Cloth and the Lensbaby Lenspen Pro can be ordered online for $15 and $10 respectively or picked up at your authorized Lensbaby vendor. Portland, OR – March 23, 2012 – Lensbaby announces today the release of two new additions to its accessory product line, the Lensbaby Lens Cloth and the Lensbaby Lenspen Pro. The new products join existing accessories including the Lensbaby System Bag, Creative Aperture Kit 2, Macro Converters and others. 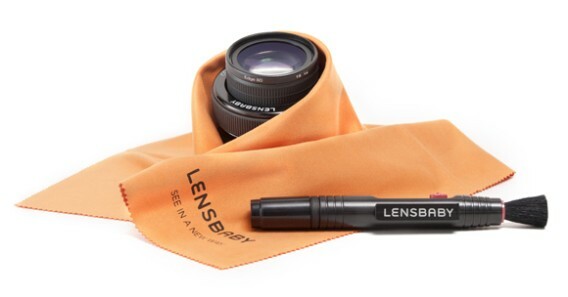 The Lensbaby Lens Cloth is a cleaning force to be reckoned with at a sizable 14” x 14” in a lovely Lensbaby-orange hue, that’s perfect for a photographer’s lenses and Lensbaby optics. The cloth is made of a deluxe silky-style microfiber material with plenty of real estate to meet any cleaning need. The size of the cloth will also allow photographers to protect their Lensbaby lens by swaddling and stowing it away in a camera bag compartment. The Lensbaby Lenspen Pro is a precise cleaning instrument for all Lensbaby optics. The pen is conveniently sized at 5” long with 2 different types of cleaning ends that gives photographers two ways to safely remove dust, particles or other contaminants found on their optics. One end is a chamois tip containing a non-liquid cleaning compound covered with a cap that replenishes the cleaning compound and keeps the tip protected between usages. The other end features a slider on the top of the pen extends and retracts a soft cleaning brush. Together, they make an unstoppable pair, from which no dust nor smudge is safe. The Lensbaby Lens Cloth ($15) and the Lensbaby Lenspen Pro ($10) are available now from www.Lensbaby.com, and Lensbaby authorized photo specialty stores worldwide. This entry was posted in Product Announcements and tagged lensbaby. Bookmark the permalink.